Pastry Chef Joseph Gabriel is head pastry chef of the Pluckemin Inn in Bedminster, New Jersey. He is renowned for his modern take on classic desserts and the way he combines new flavors and textures for a mouth-watering explosion for his diners' tastebuds. The Pluckemin Inn, where Gabriel calls home, is a contemporary American restaurant in north-central New Jersey. Modeled after a colonial-era farmhouse, the inn is pastoral and picturesque with Old World-style stone walls, arched entranceways and large exposed beams that crisscross high ceilings. While extremely comfortable and cozy, the inn is a sophisticated, chic and modern locale, which features some of the most high-end food in New Jersey, as well as fine wines (more than 15,000 bottles in the wine cellar) and incredible service. Part of the Pluckemin Inn's draw for diners is Pastry Chef Joseph Gabriel's elegant creations. Gabriel has been cooking professionally since the age of 16, when he worked under pastry chef Michael Gabriel and pastry chef Dan Rundell at the renowned Aureole. He dipped chocolates on the weekends and began to learn the ins and outs of professional pastry making. Next, Gabriel attended SUNY Oneonta to study food and nutrition, continuing to work at Aureole during the summers to continue his pastry chef education. Finally, this acclaimed pastry chef attended the venerable New England Culinary Institute (NECI) and ultimately graduated with the coveted Chef LeBorgne Scholarship. After graduating from NECI, Gabriel worked in several different kitchens, including Aureole in Las Vegas and New York City, Aqua in San Francisco, Petrossian Paris in New York City, and Lenox in New York City. With so many different stints at restaurants throughout the United States, he was introduced to several types of ingredients and flavors, which influence his dishes today. After working under several acclaimed pastry chefs, Gabriel struck out on his own, opening Gabriel's Dessert Boutique on Staten Island. It was a luxurious boutique that highlighted the chef's innovative creations and received many accolades from some of New York City's top publications. Following the closing of his dessert boutique, Gabriel worked for N9NE Steakhouse in the Palms Hotel and Casino in Las Vegas and Ocino in New Jersey, and then was offered the position as Pastry Chef of the Pluckemin Inn. Today Chef Gabriel continues to refine his craft, using seasonal ingredients from local and regional farms. His talent for combining unusual ingredients and flavors with classic techniques has earned him some fantastic reviews in the press. Cody Kendall of the New Jersey Star-Ledger says that Gabriel's "Desserts are so beguiling and different that they'll make your head spin; you'll want them all." Bob Lape from Crain's NY Business called his desserts ". . .a series of sweets that thrill the palate." 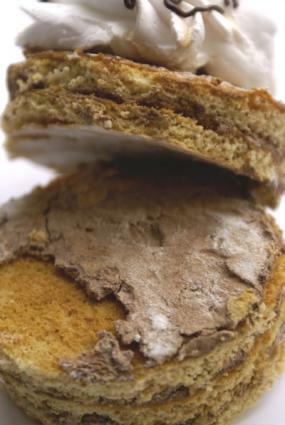 The New York Times noted that "Desserts made by Joseph Gabriel were superlative and are successful blends of the old, the reimagined and the new"
He is also affiliated with the American Culinary Federation, US Pastry Alliance, New England Culinary Institute Alumni, French Culinary Institute Guest Chef, and the James Beard Foundation.